It pays to read your mail –I received some form letter that I thought was junkmail at first, but it turned out that I was randomly (?) selected to answer the AMERICAN COMMUNITY SURVEY, which is produced by the the US Census Bureau. It is NOT the actual census itself, which must be done in 2020, as it has been every decade since 1790. Among its many uses and benefits, the Census helps determine what communities get government funding — and how electoral district lines get drawn to choose our lawmakers. It’s the gerrymandering and manipulation of such data that brought in the current gang of crooks and supremacists to DC — and they are using their powers to run the next census to further suppress voters of color, those who are immigrants and naturalized citizens, and anyone who is likely to oppose them. One of the diabolical ways to accomplish this is to add a citizenship question to the next census, in expectation that this will reduce the number of responses from the communities who are not part of making America white again. This plan to use the census to suss out citizenship has become a big controversy for these reasons and more. 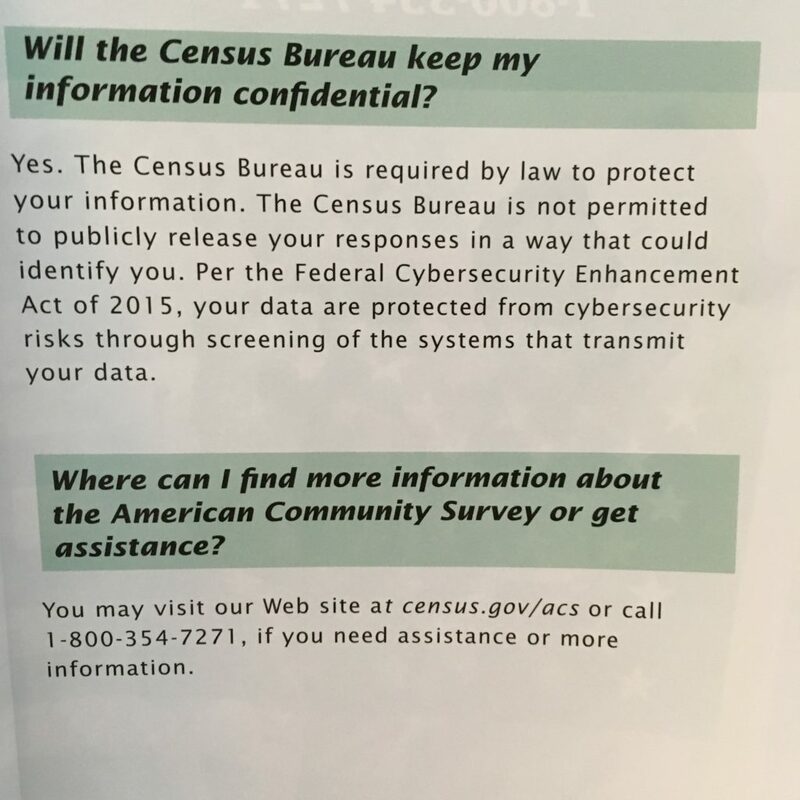 But what about that AMERICAN COMMUNITY SURVEY that I got in the mail, and which is also produced by the same US Census Bureau? Over the years, I’ve used the ACS data many times in my own research, but its survey is not the actual census. To my knowledge, the ACS has not been part of citizenship question debate. 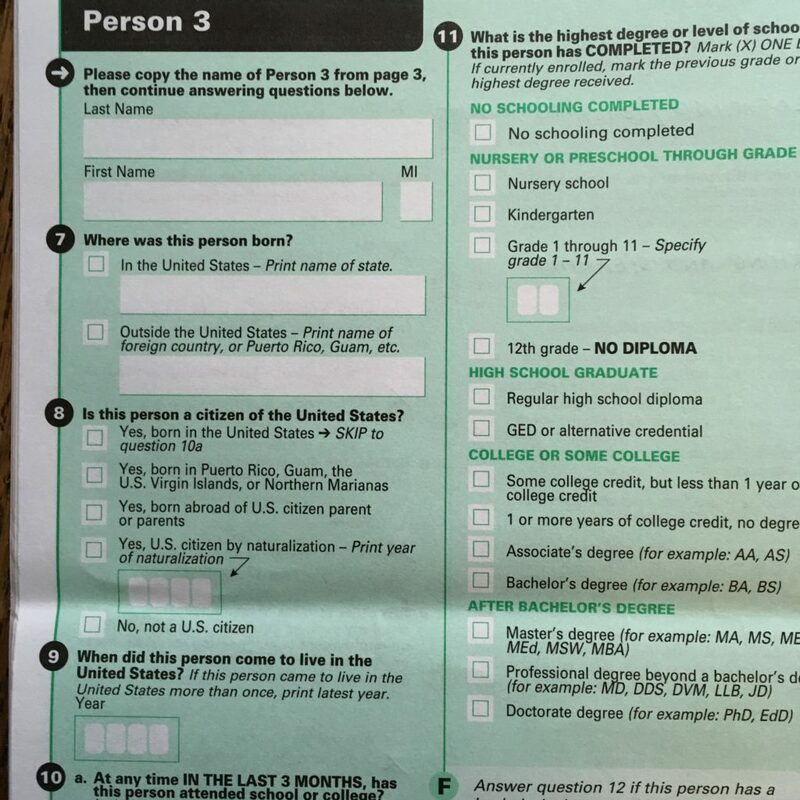 In the ACS form I received in the mail, the survey asked many personal questions about everyone in the household — including CITIZENSHIP! Check out the photo I’ve attached of the survey! And, yes, it is very off-putting because it asks to NAME each person and to indicate where they were born, if they are a citizen, and how long they’ve been in the US. For EVERYONE in the household! Very chilling. Then there’s the “confidentiality” message, see photo below, which seems very carefully worded. It says that no “PUBLIC” release will occur — but notifying ICE or other government agencies is not a PUBLIC release. And let’s not forget that during WWII, the census surveys were used to identify perceived “enemy aliens,” including American citizens of Japanese, German and Italian descent. Is there any reason to trust the confidentiality or integrity of the current regime? This ACS survey is a prelude to the 2020 Census and seems to be a stealth test run to drive down the numbers for the actual census. Big Brother is snooping — and La Luta Continua!